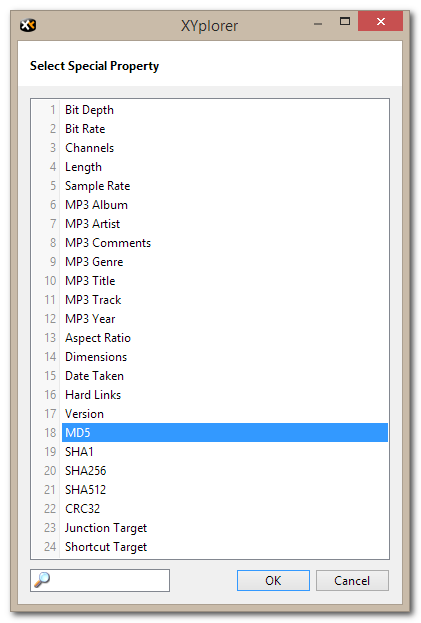 Audio Properties in Columns. 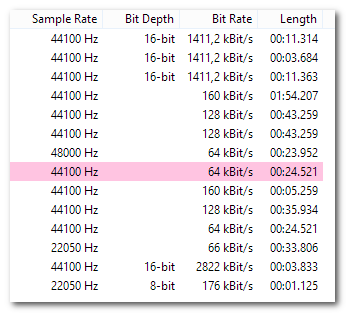 XYplorer now features columns for Audio Sample Rate and Audio Bit Depth, and some other audio related properties, for example Audio Length with milliseconds precision. As you might know this stuff had been removed from Explorer in Vista and still is missing in Win 8.1, so XYplorer brings it back to you with this release. Extended Properties in Columns. 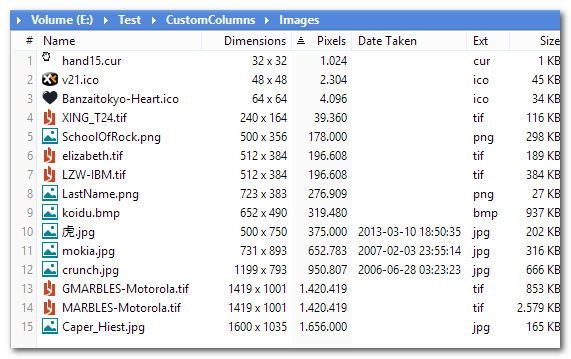 Now you can finally show all extended file properties in columns. Like Owner, Subject, Comments, Camera Model, Aperture, File Version, Album, Artist, Title, etc. There are hundreds of them in today's Windows. 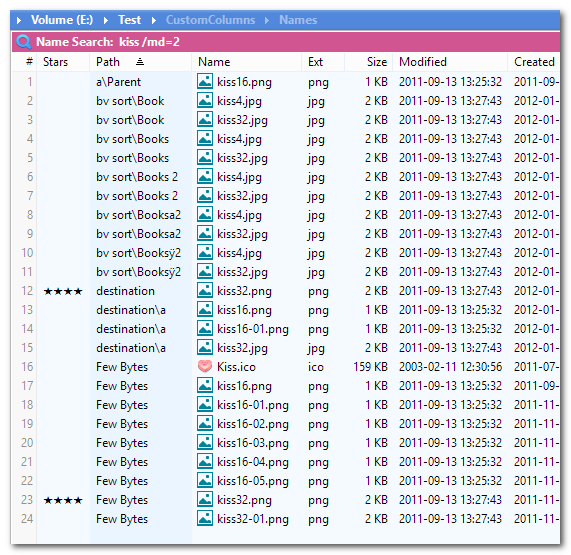 Selecting an extended file property. When you OK the dialog the right-clicked column is immediately filled with the appropriate data. 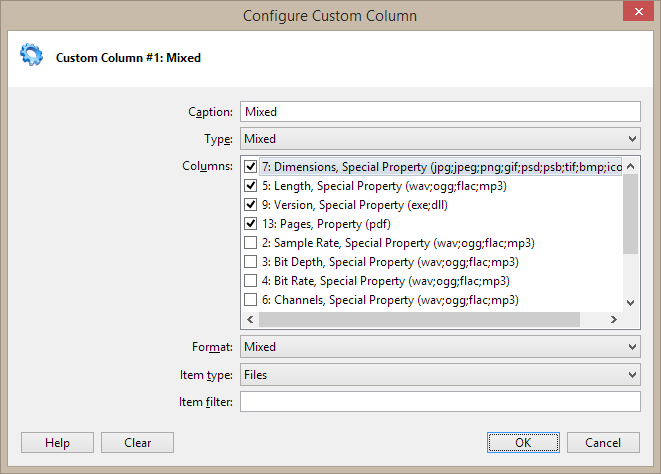 You can change the contents of such a Custom Column on the fly. 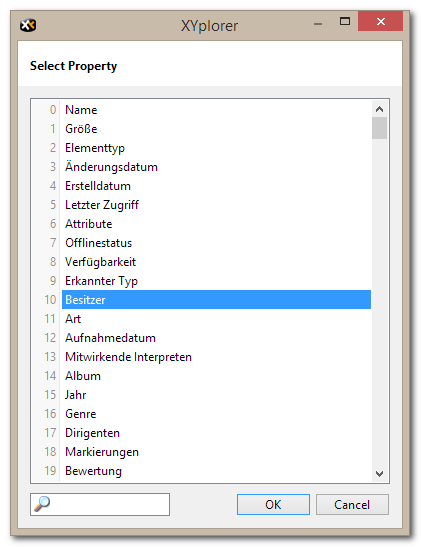 Simply right-click the column header again and choose another property. 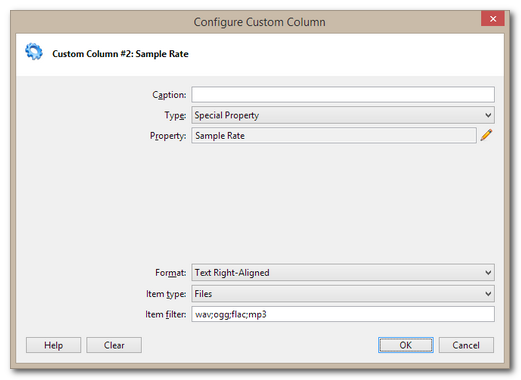 Special Properties in Columns. 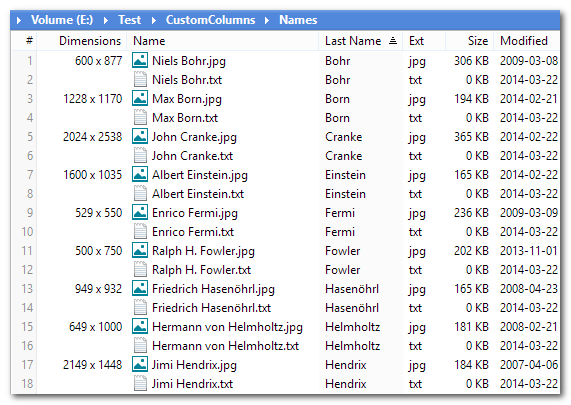 And, of course, now you can also show XYplorer's special properties in columns, that's stuff not included in the Windows extended file properties. E.g. 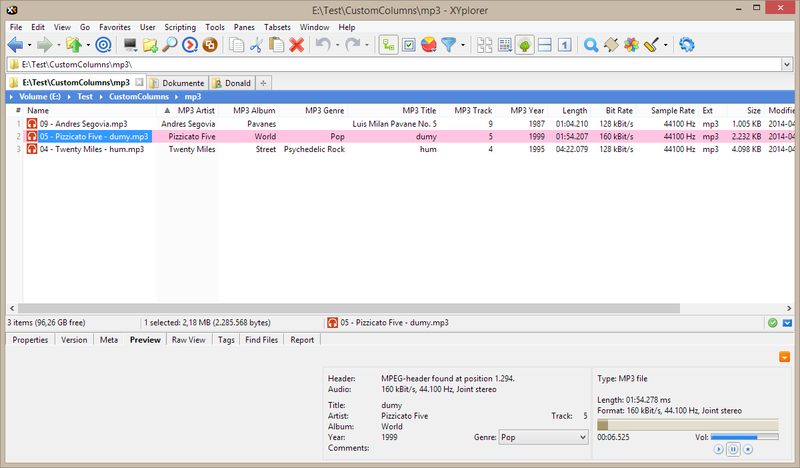 Aspect Ratio, MD5 hash (and many other hash functions), Number of Hard Links, Junction Target, various MP3 tags, and more. 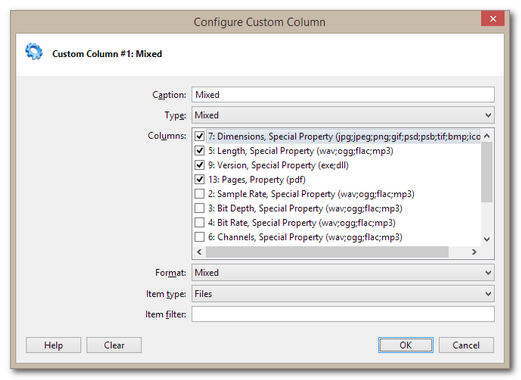 Analog to the extended properties described above, you right-click a custom column header and click Select Special Property. Then you select a special property from the list. 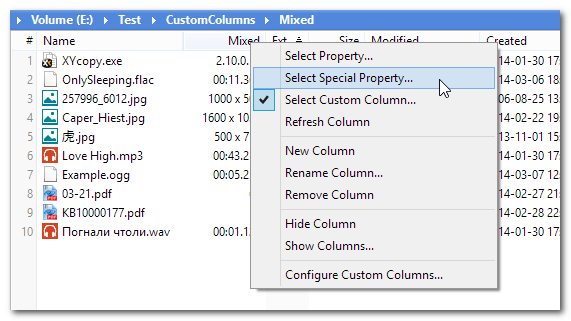 The list of available special properties in XYplorer 13.90. Context-Smart Columns. 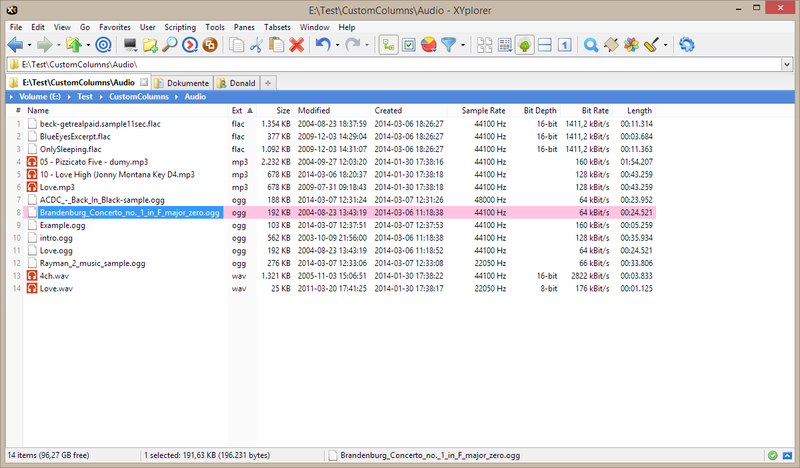 Ever dreamt of columns that would show dimensions for images, play time for audio files, page count for documents, and the version number for executables -- all in ONE column?! 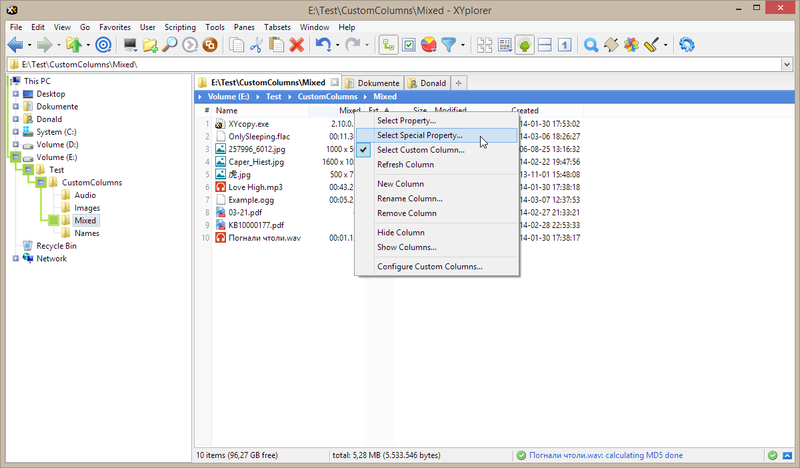 Well, you can have that now in XYplorer, and it's you who decides which property is shown for which file type in such catch-all columns. And this is the definition of the above shown Mixed column. 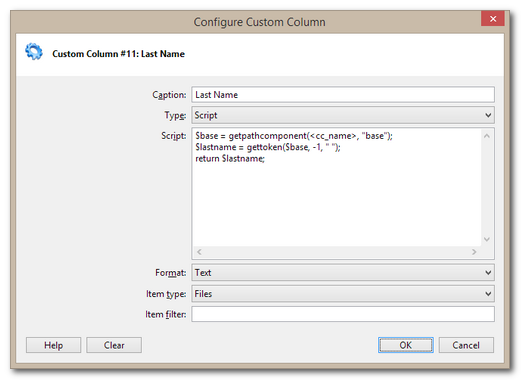 You get to this Window via Tools | Configuration | Custom Columns | Edit. Scriptable Columns. But it gets even better. 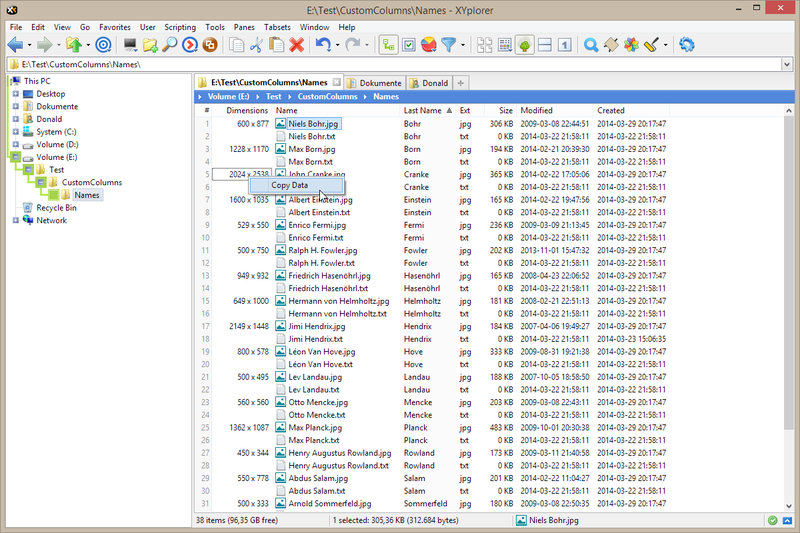 With this version you can roll your own columns using XYplorer's scripting language. You decide what they show, for which files, and how they show it. A world premiere. No file manager has ever gone there before. Scriptable Columns might prove to be a killer feature. Its possibilities are virtually unlimited. And, to our knowledge, there is no other software existing at this point that comes even close to this feature. Open Tools | Configuration | Custom Columns, and dbl-click the first "Undefined" item in the "Custom Columns Definitions" list. 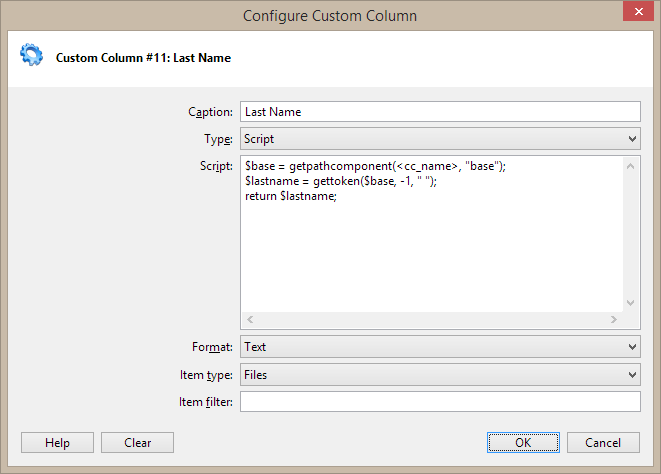 This will open the Configure Custom Column dialog. 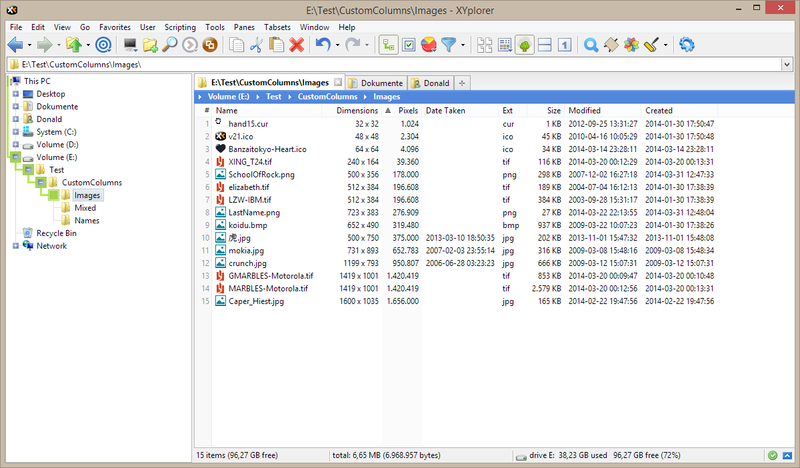 What the script does: First a extracts the base name of the currently processed file (whose cell we are about to fill), that's the filename without the extension. Then it extracts the last part of the base name, where parts are defined as separated by spaces. Finally that last part is "returned", i.e. it will be written into the cell. 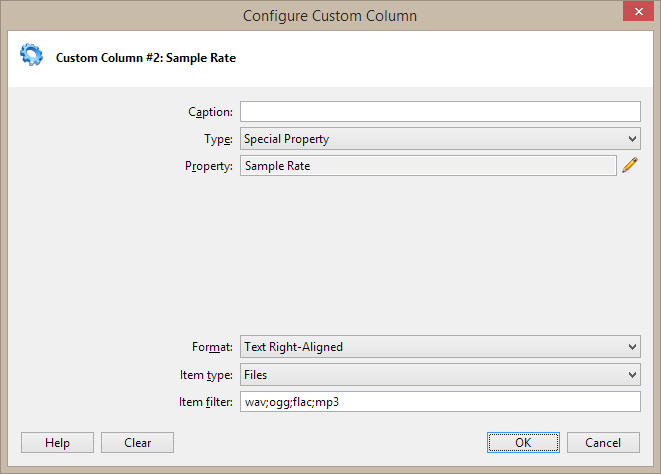 OK the Configure Custom Column dialog and the Configuration dialog. This definition will now be available to new columns in each file list. It is stored in the INI file and hence retained across sessions. And, of course, it is portable. You can carry your Custom Columns with you on a USB stick. Click View | Columns | New Column. 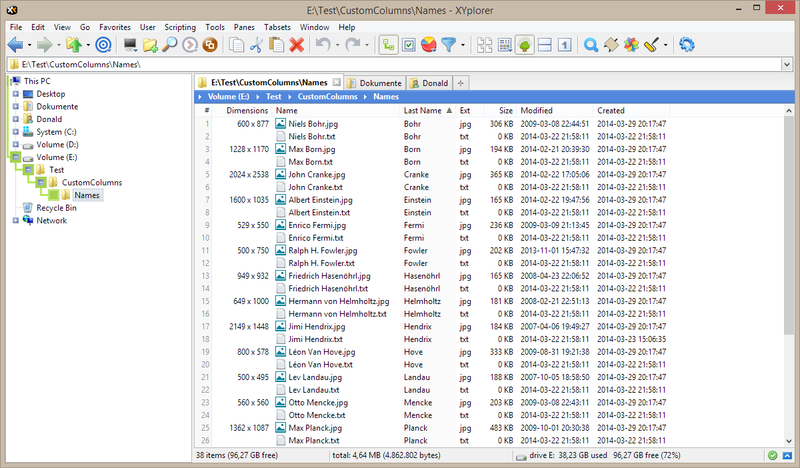 A column called "New" will appear in the file list. In later versions: Click View | Columns | Add Column. 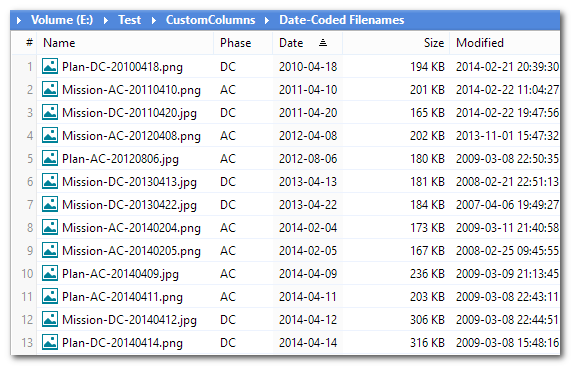 A column called "(Undefined)" will appear in the file list. From the list select the newly added Last Name column at the bottom. Done. You now should have a column filled with last names. Final Remark on Scriptable Columns: Note that these are only some very simple examples. You can do a lot more with Scriptable Columns. But be careful, a script can be a powerful little machine, and be aware that the script in a scripted column is called for each item in the file list. The above features are part of the Pro Edition only, not of the Free Edition. Copy Data. 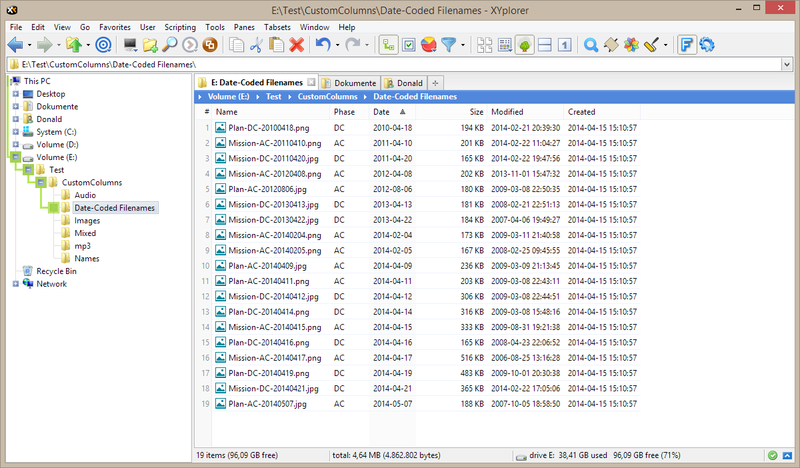 Now you can copy the contents of any single cell in the file list to the clipboard in a very comfortable way. 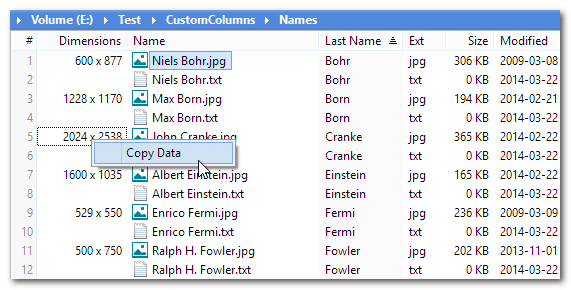 When you hold CTRL and right-click a non-empty cell you get a small popup menu with one command "Copy Data" by which you can copy the contents of the cell to the clipboard. Works with all cells in all columns. Note that any selections in the list are not affected. Instead of holding CTRL you can hold the left mouse button down and then do a right-click (while the left button is down). Depth-Limited Search. 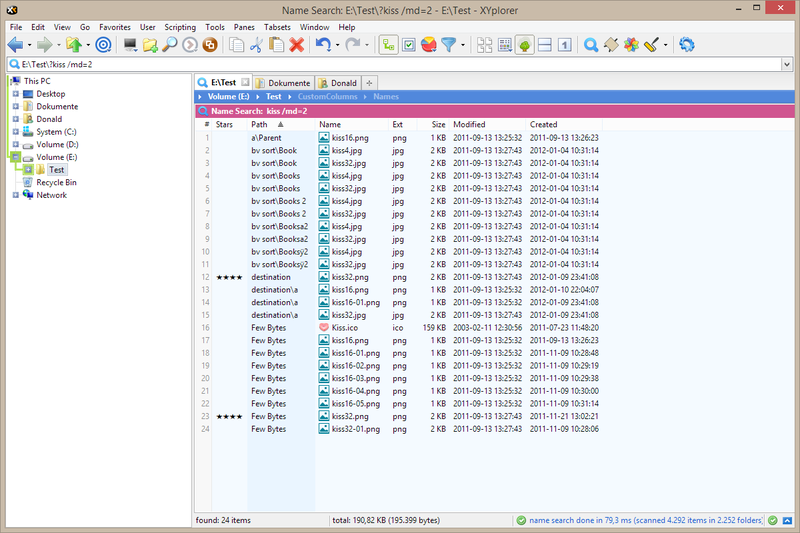 Now you can limit the search depth of Find operations, for example you can search only the parent and its immediate child folders but not any deeper. Nifty and potentially time-saving. Simply append the switch "/maxdepth=n" to the search term in the name field, or it's shorthand form "/md=n". 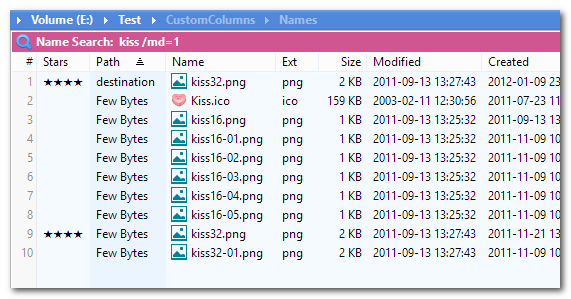 For example, to find all items containing "kiss" in the current level and one level below you would use kiss /md=1 as search term.